Prevision Dragon Tiger is a game where players bet on who has the higher points of card (suits are excluded), K is the highest point & A is the lowest points. Same point will count as Tie. 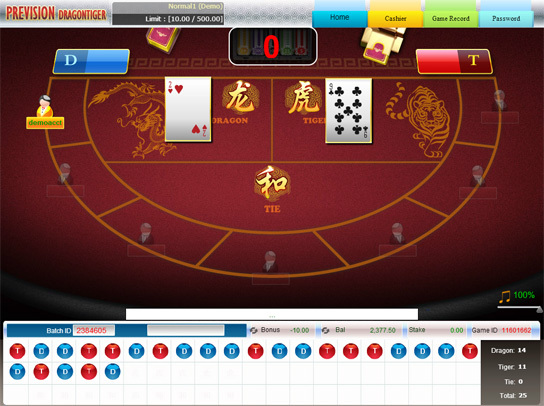 Players are able to bet on Dragon, Tiger or Tie. One card is burned at the beginning of every game, and then the banker deals two cards. The two cards will be dealt face up, one to the Dragon first, and then to the Tiger, wichever sides with a higher total wins. If the values of two cards are the same, then it will count as Tie. This is a non commission game. However, if the outcome is Tie, any bets on Dragon or Tiger will lose half of the stake.